Prepare cornbread muffins according to package instructions. Allow to cool completely. Season chicken breast with salt, pepper, cumin and chili powder. Bake for 15-17 minutes or until internal temperature is 165°. Allow to cool and dice into small cubes. In a mixing bowl, combine chicken, blue cheese crumbles, hot sauce and ranch dressing; reserve. In a large sauté pan, heat oil over high heat. Cook the celery and garlic until tender; add reserved chicken mixture. Cook for 2-3 minutes to heat mixture through. Hollow out inside of muffins and fill with ¼ cup of chicken mixture. 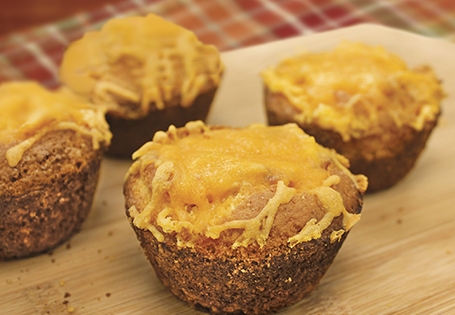 Top with cheddar cheese and bake for 4-6 minutes or until cheese is melted and slightly brown.